Where can I buy the additional fan mount for the front of the MasterBox 5? Is there a Chance of a Tempered Glass Sidepanel for the Masterbox 5? Welcome to CM forum . 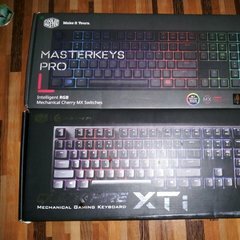 Hi Thomas , Try check in this link : http://www.cmstore.eu/ if the item not in the listed , Please email CM store at here : shop@coolermaster.eu They will assist you . Yeah, i know there are 2 Tempered Glass Side Panels in the shop! One for the COOLER MASTER MASTERCASE 3 and the other for the COOLER MASTER MASTERCASE 5 & 6! Is it possible that someone knows, that one of this Tempered Glass Side Panels fits on the Masterbox 5? I will check that via the shop Email, thanks! Sorry for my bad school and google translator english! Edit! Answers from the Shop Chat! "This part (Tempered Glass Side Panel for Masterbox 5) is not available as spare part yet"
"Yes it will become available as spare part"
"It will unfortunately still take a while, at least 10 weeks"
"The Tempered Glass Side Panel for Mastercase 3, 5 & 6 doesn't fit"
Why doesn’t CM offer parts for Masterbox 5?? ?